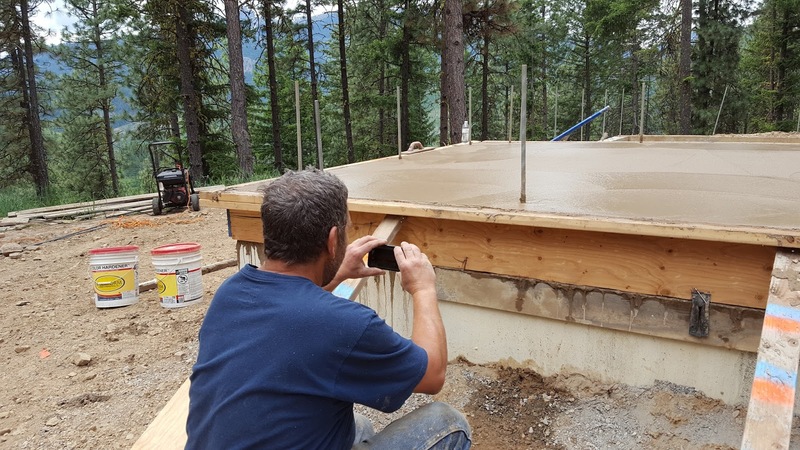 The final piece of concrete construction is a patio slab. The patio is enclosed within the footprint of the house, so it sits on top of the foundation stem walls and supports the weight of one gable end of the house. Because it is structural, it required engineering and an inspection of the rebar. 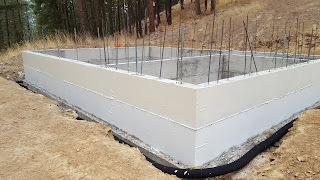 We poured our stem wall foundation last fall and returned the borrowed forms. Without the forms in place below, forming a slab on top of the existing foundation presented a couple of minor challenges. The outer perimeters of the slab align with the exterior of the stem wall. So we couldn’t just build a form on top of the stem wall with snap ties and shoes. It had to be supported some other way. At 10’ x 16’, the form panels needed to be laterally supported to prevent them from bowing or blowing out. Laying lumber braces across the top would interfere with the screed rail. My solution was to heat and bend snap ties so they would wrap around rebar uprights embedded every 14 inches in the stem wall. The 3/4 inch MDO form panels rest on top of the snap ties, and customary metal shoes clamp the forms in place. The close-up photo shows the modified snap ties. The shoes needed support from beneath. I temporarily mounted some 1x6 lumber scraps along the top exterior of the stem walls. I used simple plastic anchors with 2 inch screws so it could be removed without leaving large holes in the exterior concrete. That took care of supporting the form panels, but it didn’t solve the bracing problem. When the inspector came out to check my rebar, it so happened he used to be a concrete contractor. We talked about ideas and he suggested running wire around the rebar and through the form panels about halfway up. 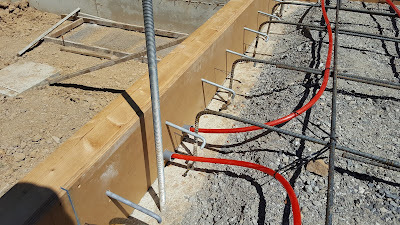 In the first photo you can see the wire coming through the panel, around the rebar and back out through the panel. Outside the panel, the wire ends are twisted around a common nail. With an 8 inch level and a pair of pliers, I could twist the wire until the panels were plumb. A couple of those are visible in the last two photos. I backed it all up with short kickers. We applied a color tint to the concrete at the plant to turn it light brown. Then we added two subtle accent colors – a rusty red and a dusty blue – that were troweled in during the final stages of finishing. 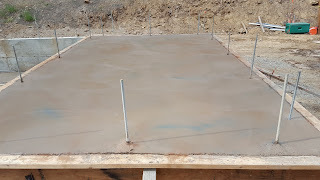 I hired the same concrete contractor on the side again for this slab. He did a great job with the finishing and he worked with me on getting the accent colors just right. Those colors are expensive because you have to buy a 50 pound bucket of powder for each color. Anyone want to buy 49 pounds of red or blue color hardener? I’m really happy with the way the slab turned out. The perimeter is straight and clean, and the bracing didn’t interfere with the fast work required to finish off the surface. The slope (1.5 inches in 10 feet) is nearly perfect and the long edge end-to-end is within 3/8 inch of level across 16 feet. The red PEX is barrier tubing for hydronics if we decide later to add radiant floor heat to the slab. We have no plans at this time, but we're keeping the option open -- you can't add lines to cast concrete. The bolts are for a ledger board to support the edge of the subfloor.